Photographic Portrait of HM King Gustav VI Adolf, 1950. C.G. Rosenberg was not primarily a portrait photographer, but was known chiefly for his images of nature and architecture. 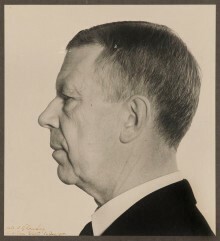 From 1922 to 1955, he was a contributor to the Swedish Tourist Association’s yearbook and, as such, was instrumental in shaping mid-20th-century popular perceptions of Sweden. Admired by many architects of the time, Rosenberg was invited to photograph prestigious projects such as the Stockholm Public Library, the Woodland Cemetery (Skogskyrkogården) in Enskede and the Stockholm Concert Hall. He was also commissioned to photograph heritage buildings and artifacts.